I assume you came here because you are looking for some horse riding helmets. Years ago I was in the same situation. Believe it or not back in the 1980s we didn’t have the internet or Amazon. It’s true, we would actually have to pick up the Yellow Pages (Google that), to find a store that hopefully had what we were looking for. If you have a tack store nearby, you are one of the lucky ones. Go there, get fitted and buy a helmet. From buying my own helmet to purchasing a horse farm in 1989, and helping hundreds of new students acquire helmets, I have learned many things along the way. Currently where I live there is only one big box store with little to no selection, or people to help you. If this is your challenge, go to Amazon where you will find hundreds of helmets to choose from. I recommend buying solid black. 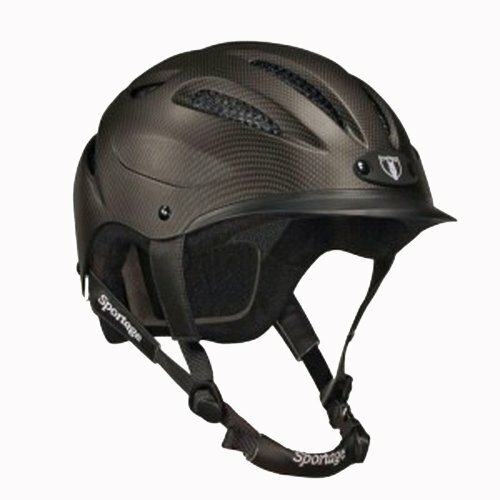 The Tipperary Sportage Equestrian Sport Helmet will do nicely. Keep in mind that once you get on a horse I can guarantee you are going to come off. Wear a helmet. May all your dismounts be safe and planned. This entry was posted in Horse Riding on February 12, 2019 by Alan. Being in a horse show is not for everybody. Not everyone wants to do the same thing when it involves horses. I’m not here to say one discipline of horsemanship is better than the other. It’s important for everyone to understand that horseback riding and ownership can take you down many different paths (literally). generally like to go out, jump fences and enter horse shows. When it’s time to begin horse showing expect a lot of nerves to come out. You want to be dressed appropriately. By this I don’t mean spending as much money as possible to get all the proper equipment. The cost of the show itself can be enough of a burden, you want to make sure that you are neat and tidy. Find a nice white shirt and wear your hair up so it doesn’t stick out and appear sloppy or in the way. being in a lead line class. That’s where someone leads you around the ring while on horseback. Your job is to maintain a proper riding position and follow instructions. While in the class you want to make sure that you smile and don’t forget to breathe. You can tell once the class is over because the announcer or judge will tell you to line up facing the judge. While in line the judge may come over and talk to you. Sometimes they will ask you questions about parts of your horse or tack. The questions don’t usually get real technical or involved but you should be prepared. When the judge is through he or she will go and hand the results of the horse show to the announcer. If your name gets called the ribbon will usually be brought to you. If that is the case then remain in line until everybody receives their ribbon. This entry was posted in Horse Riding on January 21, 2018 by Alan. There are free internet horse games you can play on your computer. They are also solo affairs and easy to find. It’s not my intention to discuss these types of horse games here. I would like to promote board games. Mostly because I believe they provide an excellent way to interact together and learn life skills. I am writing about horse games because, well, this is a site about horses. Our society as a whole is spending too much time staring at screens. Xbox and the Wii are tons of fun. However, with these games, the focus is not on each other. When a family or group plays a board game they learn a lot more about the people they’re playing with. Most board games will allow different ages and skill levels to play against each other. This allows parents and children to interact together. Playing games with a deck of cards or by rolling dice leave the end result open to chance. Strategy is involved but even a first timer can win. A lot of children today have learned to get what they want when they want it. When they play a board game with a group they will learn that they cannot win all the time. Learning how to lose gracefully at an early age can help them throughout their life. Dealing with winning introduces many other delightful feelings and emotions. In my post horse games for girls you’ll find several different types of games including role-playing with action figures. So instead of immersing everyone in the family in their own separate activity, such as chat rooms, Pinterest, Game Boy or even watching a movie together, try a board game. Instituting family game night can open up communication. Instead of grunts and monosyllabic answers you might be able find out how each others day went. There are numerous classic board games to play. I hope you will encourage your child’s interest in learning about these beautiful animals by trying horse games! This entry was posted in Horse Riding on January 17, 2018 by Alan.